The world is on the cusp of a digital revolution where machines will be talking to machines. 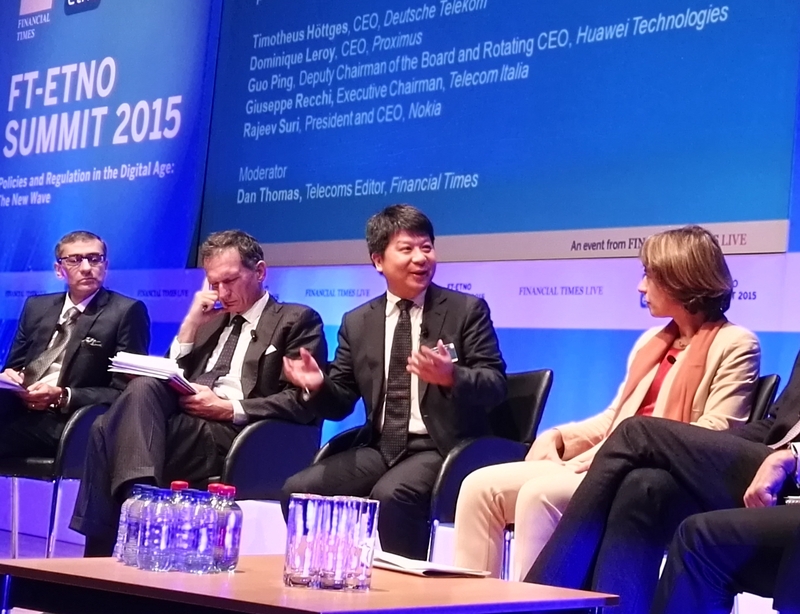 Huawei’s Guo Ping believes that Europe can take a leading role in 5G and the internet of things, but points to risks ahead for manufacturing in the country he knows best, China. Guo Ping is deputy chairman of the board and rotating CEO of Huawei. He spoke to EURACTIV’s Jorge Valero. How do you see the European cooperation with China in the development of 5G? The information and communications technology (ICT) has entered in the fastest-growing period ever. Our target is to work with the European partners to build a better-connected world. We need 5G because we understand that connection is not only among people. 5G is not about that. It is about connecting people and things, and things with things. According to Gartner’s estimates, by 2025, there will be another 100 million new connections in the world. So if we want to build the information society, the connection among people is not enough. 5G is about internet of things and enabling vertical industry, and the required applications for that. How will this world coexist with the current one? The ICT component will make the industry more complex. Two decades ago we saw two parallel lines, the internet and the industry itself. Now 5G is combining both realities: the virtual industry and the physical industry. The connection system has become more complex and that requires huge investment and collaboration in Europe and China, and all over the world. We see that the cooperation strengthens between Europe and China in the standardisation process and developing of the whole industry chain and the R&D, because the 5G system requires interconnectivity in the world, so any country involved cannot be an island. There are two aspects that will be very interesting for Europe, because we understand that Europe is very strong in the traditional industry, for example the automotive industry and the chemical and mechanical manufactory industries. So these are the traditional advantages for Europe. Europe can fully leverage digitalisation to transform the traditional industries and to maintain its advantage and further expand them on these vertical industries. The second aspect is about the social services. Singapore’s programme ‘Smart Nation’ offers 98% of services accessible through Internet. Leveraging 5G infrastructure could help Europe to increase its efficiency and to improve service quality and enhance its competitiveness. How do you see China’s involvement in the so-called ‘Juncker Plan’ and how could you benefit from it? It is a huge investment plan and we welcome it, because we believe it can further enhance investment between China and Europe. In the future, the broadband network can enable Europe to build a better connected world. For that, we need more capital, and this plan can bring the needed investment. This is a joint opportunity for China and Europe to develop broadband. Huawei closely cooperates with our local partners and with Europe’s investment activities. For example, we participate in the 5G Public Private Partnership and in 25 Horizon 2020 projects. Meanwhile, we have a research team of 1,200 people and we have one European Research Institute and eight European research organisations operating in 18 countries in Europe. How is Europe doing in the field of innovation, compared for example to China? I think Europe is leading in terms of standard regulation and value chain building and also establishing standard bodies. Europe is very successful on that. For example the 5G PPP will play a very important role in taking the leadership in 5G development. I think Europe has the opportunity to lead on 5G development. But I do think there are problems concerning Europe. For example, mobile penetration in Europe is 120%, the number one in the world. That means that previous policies for mobile penetration were very successful. However, the competition between the European telecom operators is more fierce than the competition in other countries and other regions. So the policies focus more on competition than on attracting investment and introducing new technologies. As an example, Huawei is located in a city called Shenzhen. This city has more LTE stations that France, an entire country. However, Europe was the first region in the world to adopt LTE. We believe that Europe’s policy focus should shift from competition to the field of future development and the investment on new technologies. You mentioned the opportunities in the car manufacturing sector. How does the Volkswagen scandal affect this opportunities? A lot of Chinese people come to Europe to buy high quality brands and that is because European products leave a very good impression of being high quality in China. So we hope that the automotive sector can solve their problems and maintain their competitiveness. My understanding is that Huawei is looking into potential partnerships with carmakers including Volkswagen. Will this scandal affect the relationship you have with the German company? I haven’t heard anything on this issue affecting our relationship with Volkswagen. Actually we have close cooperation with Japanese carmakers, European carmakers, and also Chinese carmakers. Huawei mainly provides the connection and the communication equipment, those modules in the cars. We are willing to cooperate with these carmakers, including Volkswagen. One lesson to take from this scandal is that no matter your brand awareness or the competitiveness of your business, firms should always take sense of strong responsibility and provide products and services that meet the market requirements, and also serve the public interest. We cannot take it for granted. In Europe we make every effort to be sure we are a European responsible corporate citizen. Regarding Huawei’s development, the company has three business areas: devices, carrier and enterprise. In which field do you feel there is more room for progress? For all the three businesses we still have big room for further development. As a carrier, the global population is 7 billion, and around 4.4 billion still cannot enjoy broadband services. For our enterprise business all countries need digitalisation and technology to transform its traditional industry, so this is our opportunity. And, as you know, our device business is also developing very fast in recent years, and we believe our products can be one of the most competitive brands on smartphones and also devices connecting to the network. Regarding the devices, do you think that Huawei could become number two or even number one, leading the race versus Apple and Samsung? I believe we have the opportunity but ranking does not matter, because this is a highly competitive industry and we saw a lot of leading companies that fell in a short period of time. Our focus is to improve our core competence and meet customers’ requirements and have sustainable businesses. And we will continue to invest in this business area. This involves not only the technology part. In Paris we establish an aesthetic institute, where they work on introducing fashion in our products. China’s economy is slowing down. Does it represent a concern for Huawei or do you see opportunities ahead? In recent years we do see that growth rates have started to slow down in China. We also saw the closing of manufactories and also some companies decided to move outside the country, due to the appreciation of the Yuan and other economic factors. We do not see a very good prospect on China’s manufacturing side. The way out is to further expand the domestic consumption inside China. Providing better and fast broadband is a way to do it. I expect within the short term that the Chinese government will offer more opportunities in broadband investment to encourage telecom operators to enhance their investment in broadband. That will be a piece of good news for Huawei. We are a global company operating in 170 countries but China is a very important market for us. We hope that we can leverage the ICT technology to transform the manufacture base and maintain its competitiveness.